Temperature Science – Download FREE Printable Reading Comprehension Science for Kids Worksheets. Our search a word puzzle game worksheet is a great reading comprehension exercise for Grammar school kids in Grades 1-5. Pre-K and Kindergarten kids can use this temperature activity sheet as a listening comprehension game. This easy science search a word word puzzle game makes kids enjoy learning facts about temperature. The temperature game for kids makes learning fun and easy for them. What do you know about temperature measurement? There are 2 extreme temperatures. These are hot and cold. Temperatures can be measured using a thermometer. Easy Science for Kids.com offers many fun online word search puzzles, free word games, search a word puzzle games, as well as great teacher resources for science worksheets. [sociallocker]Download fun and printable Temperatures worksheet for kids. 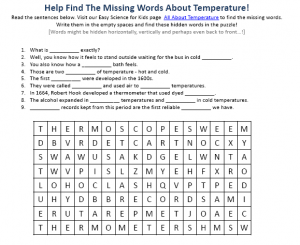 Download the Temperature Science Worksheet! Like the Temperature Science worksheet? Read more lengthy information about temperature science here. Declan, Tobin. " Temperature Science - Download FREE Printable Reading Comprehension Science for Kids Worksheets - ." Easy Science for Kids, Apr 2019. Web. 21 Apr 2019. < https://easyscienceforkids.com/temperature-science-download-free-printable-reading-comprehension-science-for-kids-worksheets/ >.